Election Day can be pretty stressful for everyone. Despite how excited we are to exercise our right, we spend the majority of the day waiting with bated breath for the results and the relief that our candidate came out on top. So let Rihanna’s latest look provide a bit of a break for your typical post-ballot anxiety buzz because, as far as we can tell, her outfit is the best we’ve seen all day. And it has her face on it. In a very meta, and very clever, move, Rihanna posted a selfie on Instagram today that featured her wearing a tribute to someone she supports 100%: herself. Specifically, herself dressed in a $35 Trapville #HILLARYGRAYBRIM Tee she wore earlier this year that includes a picture of Democratic presidential nominee Hillary Clinton wearing a New York Yankees hat and a smirk. 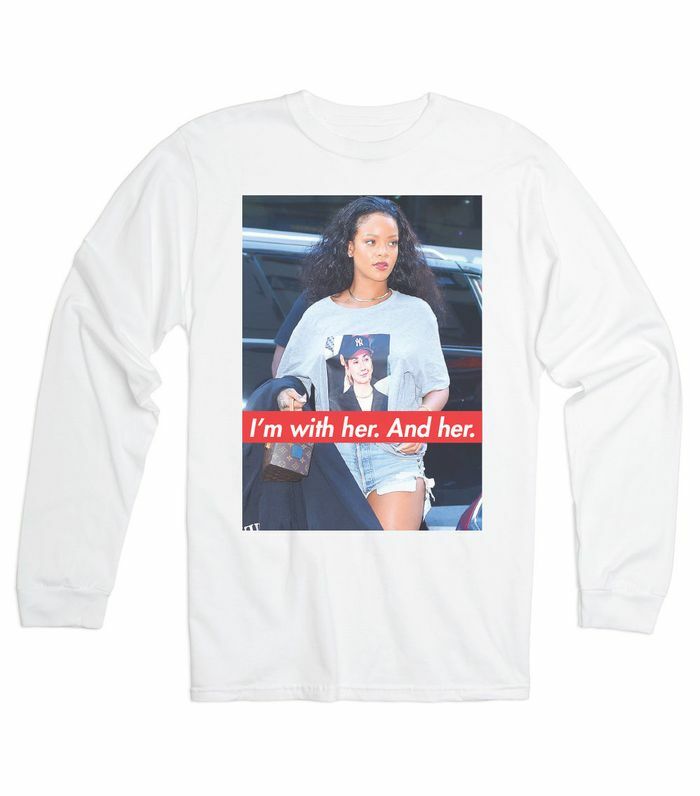 In laymen’s terms, Rihanna wore a T-shirt of Rihanna wearing a T-shirt of Clinton. Appropriately it read, "I'm with her. And her." While the singer is unable to vote in this year’s election, as she’s Barbadian and not registered within the U.S., we can still appreciate someone who’s vocal and forthright about such an important election season. And the fact that she does it with a little bit of humor certainly helps, too. Scroll down to see the complete look and shop the "I'm with her. And her." shirt from Based DTLA, too. And don't forget to vote today! If you're not sure how or where, visit Rock the Vote for all the details.